Win An Observatory Village Home • Shroud Of The Avatar Sweepstakes By Meretz - KABALYERO - PLAY, BLOG & EARN! A chance to win an Observatory Village Home in Shroud of the Avatar. It's a new Village Home and you can get it for FREE but only if you win. I'm not a big fan of the Observatory Village Home but if there is a chance where I can get it for free then why not and, you and I, can do just that by joining the Shroud of the Avatar Observatory Village Home Sweepstakes by Meretz. To participate in this sweepstakes, you'll have to download and install the Meretz Gaming Fitness App in your mobile device and it's available in Google Play and the iOS App Store. After that, you'll need to connect Meretz to your Shroud of the Avatar account and also connect Meretz to a Fitness Monitoring App like Google Fit. Next, you'll need to earn at least 3000 Meretz Points to buy a Ticket for the sweepstakes and you can earn Meretz Points by simply being active. To increase your chances of winning, you can buy 1 sweepstakes ticket everyday as long as you have enough Meretz Points in your Meretz account. 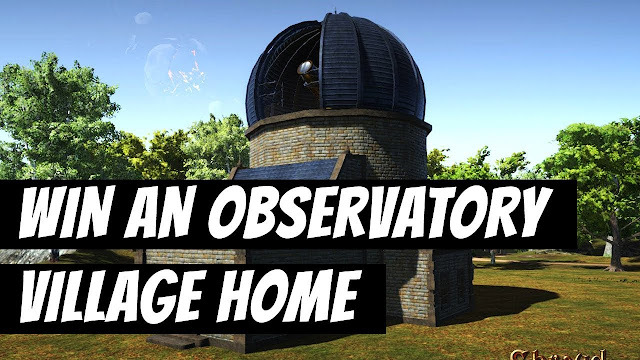 So, if are a Shroud of the Avatar player and you are interested in owning an Observatory Village Home in the game then why not take a chance and join the Shroud of the Avatar Observatory Village Home Sweepstakes by Meretz. Buying tickets for the sweepstakes started on April 4, 2018 and it will end on April 30, 2018. For more information, visit the official Meretz Gaming Fitness website and Twitter account. Anyway guys, if you have any comments, questions or reactions then please post them in the comments section below and, as always, if you are lagging badly in Shroud of the Avatar or in any online games then I suggest you try using WTFast.